Shopping for Christmas presents to give to friends and family is one of my favorite parts of Christmas. It ranks right up there with baking cookies and trimming the tree. I love to see the smiles they give me when the gift they opened is just the right one for them. But shopping for holiday gifts is a lot more challenging when you are on a budget. While some people find the challenge exhilarating others have a hard time being up to the task. Is there a way to give gifts on a small budget and still see satisfied smiles from your family? Make a list and check it twice. I’m not kidding. First list everyone you want to get a gift for. Next slash the list to only those people you absolutely must buy a gift for. When you give gifts on a small budget you must think in terms of what you must buy first. After buying those gifts if you have a little money in the budget left over you can start adding names back to the list. Once your list has been made you can determine what to get each person. Remember, you need to keep the cost down enough for each person to be able to get a gift for everyone on the list. It isn’t easy to find inexpensive gifts that you like for the holidays. One strategy that may help is to buy items when they are on sale. Take advantage of Black Friday and Cyber Monday sales as well as other sales throughout the holiday season to use your money wisely. If you made your list far enough in advance you can even shop in the spring or summer and save on off season and clearance prices. If you are creative and talented you might be able to make many of the gifts you give and keep costs down further. For example, I can sew so I sometimes make gifts for my friends who can’t. You can also set up an assembly line process to make similar gifts faster and cheaper. A friend of mine did this last year and saved a bundle. Look for savings when you order gifts online by using coupon codes and rewards points. Some of the sources you order from may give cash back and other discounts. Look on their websites to get more information and take advantage of these money savers. Buying items in bulk may help you to avoid shipping charges. However, don’t order extra just to get the shipping free if it doesn’t make sense. Did you know some stores will ship for free if you have items delivered to the store and then pick them up? Of course, you may have crowds to deal with, but it could save you enough to make the hassle worth it when your budget is small. Comparing prices can help you give gifts on a small budget too. Check more than one store and the internet to see if the item you are buying is available elsewhere for less. Don’t forget to look over items carefully to make sure features are the same or similar enough not to matter. Holiday shopping can be a fun and rewarding experience despite the challenges of a small budget. Use these tips to help you give gifts on a small budget and still enjoy the happy smiles of your loved ones. 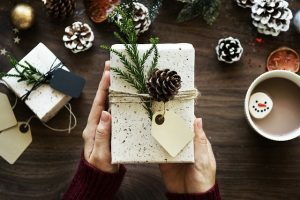 Are there other ways to give gifts on a small budget?